Mount St. Joseph’s James Bishop (center) and Goretti’s Przemek Golek (left) and Abdou Tsimbila battle for a loose ball during Sunday’s Baltimore Catholic League contest. Goretti defeated the No. 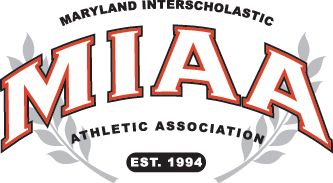 5 Gaels in Hagerstown to remain St. Frances’ heels for first. It was a blast from the past on Super Bowl Sunday as Baltimore Catholic League basketball, once a staple on Sundays for decades during the winter season, was on display with two matches. St. Frances Academy and St. Maria Goretti continued its front-runner status with victories. In Hagerstown, Goretti defeated fifth-ranked Mount St. Joseph, 74-52. RJ Blakney, a Baltimore native, scored 24 points for Goretti (21-4 overall, 10-2 BCL) and Penn State recruit Abdou Tsimbila added 14 points and eight rebounds. Goretti led wire-to-wire, completing a regular season sweep of St. Joe (19-6, 8-3 BCL), which entered the weekend in tied for first. Now, the Gaels are third after Sunday’s result and Friday’s loss to Loyola Blakefield (6-5 BCL), which hadn’t beat the Irvington school in the previous 22 meetings. Senior guard James Bishop posted a game-high 30 points for Mount St. Joseph. The LSU commit poured in 20 in the third quarter as the Gaels cut a 15-point deficit to six. Blakney, a 6-foot-5 wing whose mother, Dafne Blakney (nee Lee) was an All-Met standout at Walbrook in the late 1980s before starring at the University of Maryland, blocked a Bishop 3-point attempt and dropped a dagger of his own on the other end, starting a run that regain control for Goretti. Rashaan Edwards finished with 10 points for Goretti, which sits second behind St. Frances in the BCL standings. The Panthers improved to 23-4 overall with a 64-52 victory over Mount Carmel in a BCL/MIAA A match inside Phelps Gym in East Baltimore. Jamal West scored 16 points for St. Frances (10-1 BCL, 12-1 MIAA A), and Chad Brown added 11. Dwight Perry led Mount Carmel (7-17, 3-10 MIAA A, 1-8 BCL) with 14 points. The Panthers built a 39-26 halftime advantage, completing a regular season sweep. St. Frances played most of the second half without junior point guard and last season’s BCL Tournament MVP Adrian Baldwin, who suffered an eye injury. The Panthers host top-ranked Boys’ Latin School Monday evening in a MIAA A Conference match. The Lakers surprised the then-No. 1 Panthers in last year’s MIAA A semifinals. Mount Carmel – Morrow 11, Dukes 4, Edwards 3, Minor 11, Little 7, Perry 14, Harding 2. Totals 17 6-11 52. St. Frances – Jones 5, Baldwin 8, Busby 2, Brown 11, Busby 4, Staten 5, Murphy 7, West 16, Balogun 2, Toles 6. Totals 19 21-29 66. Jamel West posted 16 points for St. Frances in its home victory over Mount Carmel Sunday. The fourth-ranked Panthers host No. 1 Boys’ Latin Monday evening. Mount St. Joseph – Crawley 4, Bishop 30, Carr 2, Chairs 8, Brelsford 3, Johnson 3, Edokpayi 2. Totals 19 11-13 52. Goretti – Edwards 10, McClain 9, Blakney 24, Rogers 5, Golek 6, Tsimbila 14, Searcy 4, Summerville 2. Totals 26 11-20 74.